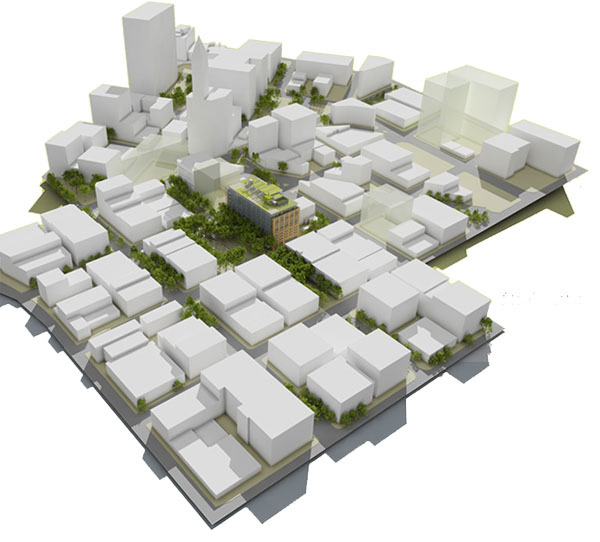 As most Seattle urbanist geeks probably know by now, the City of Seattle recently unveiled proposed rezones for South Downtown area as part of an ongoing strategy to stimulate development in the “CenterCity.” This PI piece has a good zoning map. During the currently winding down development cycle, south downtown experienced surprisingly little development. So it’s probably reasonable to expect that the coming upzones will help unleash a pent up demand in the next upturn, or perhaps sooner. Let’s take a look at recent goings on down there, and how the new zoning may or may not be relevant. A big loss for Pioneer Square came in April when the City made a final decision not to resurrect the waterfront streetcar, scuttling plans for a ten-story mixed-use building at 200 Occidental that would have housed the trolley storage barn. Mithun’s design won a Seattle AIA honor award in 2007. 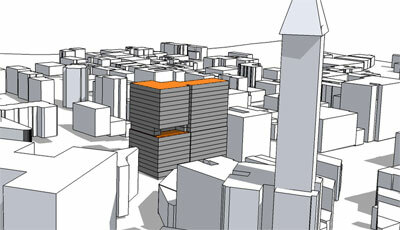 The site is on the east edge of Occidental Park, and the building would have provided long needed activation to that open space. 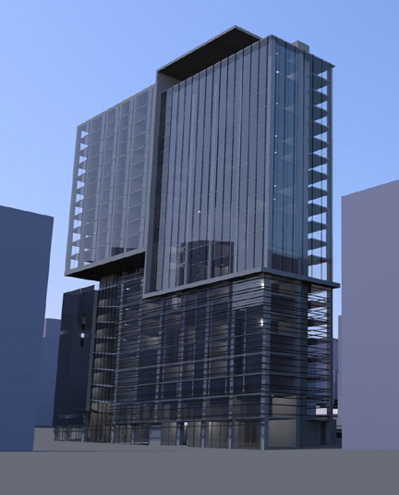 The proposed building tops out at 130 feet tall, and so could not be built without a building height upzone from the existing 100 feet to the currently proposed 130 feet. It’s been nearly two years since King County selected Nitze-Stagen, Opus, and the Seattle Housing Authority to redevelop the 4-acre chunk of the QWEST Field parking lot known as the “north half of the north lot,” and a year since the $10.1 million land sale was approved. The $270+ million project will include at least 400 housing units, including 100 affordable units. The project must also accommodate 500 parking stalls to replace the existing surface parking, which will be a serious design challenge, especially since the site elevation allows for very little excavation — most of the parking will have to be above-grade. There has been little information made public on this project since the land sale. Reportedly the developers have been waiting on the finalization of upzones, and it appears the City is about to give them what they want — the proposal calls from raising the maximum building height from 120 feet to 240 feet, specifically on the north half of the north lot. 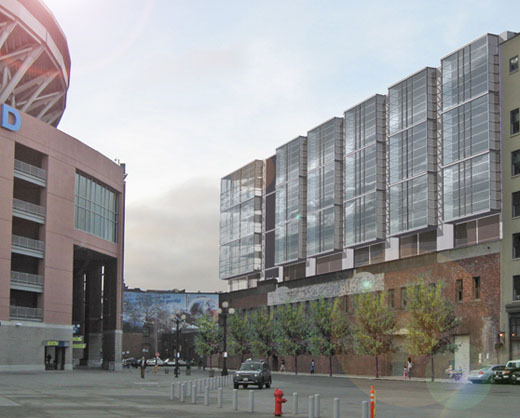 Depicted in the rendering above is Stadium Lofts, a condo project to be built on top of the the historic Seattle Plumbing Building located between QWEST Field and the 1st Ave Highway 99 on-ramp. First proposed by Nitze-Stagen, the project is now being developed by Barrientos and designed by Weinstein A|U (the second triangular building for this team). The 84-unit building will top out at 100 feet, and is in a area that is currently zoned for 120 feet, with no changes proposed. And speaking of flatiron buildings, there’s a big hole in the ground at 505 1st Ave S, just to the north of the Triangle Hotel and Bar. Soon to fill that hole will be a 7-story, 308,000 sf office building with 440 underground parking stalls, to be occupied by Starbucks. This building is allowed under existing zoning. Up at 4th Ave and S. Washington St, Pb Elemental has proposed a 24-story mixed-use project with a 144-key hotel, 105 condo units, retail, and 140 above-grade parking stalls (as noted here). The bus/light rail tunnel is below the site, which is why the parking must be above-grade. 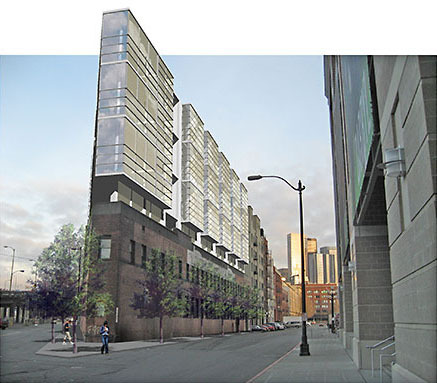 The current zoning at this site allows a max building height of 120 feet, and the proposed upzone is for 240 feet — this project could not happen without the upzone. 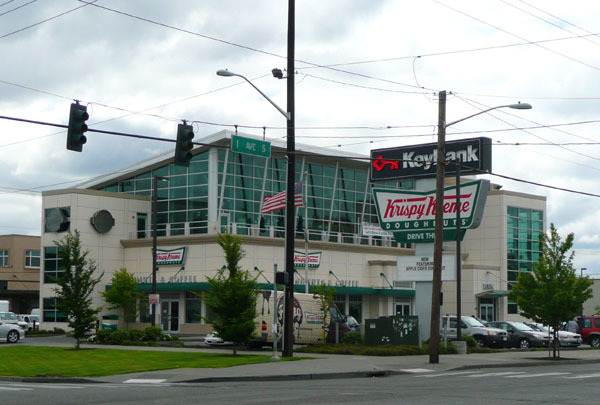 Just across the south boundary of the south downtown planning area at 1st Ave and Holgate, we have apparently given up on all that pedestrian-oriented urban design nonsense: Here you’ll find a supreme example of suburban-style car-oriented retail at the Krispy Kreme donut factory/cafe, built only a few years ago. Check out that perfect, and perfectly useless lawn! Would it not have been possible to ask them to put the building out on the corner and the parking behind? Most of the older buildings along this part of 1st Ave have little to no setbacks. Granted, this is not an area that anyone would claim to be a pedestrian paradise. But in a few decades, there will likely be considerable of numbers people walking these streets. Posted by dan bertolet on	Monday, June 9th, 2008 at 11:27 pm. You can follow any responses to this entry through the RSS 2.0 feed. You can leave a response, or trackback from your own site. Absolutely awesome post! I’ve been wanting to know the project details of that area for so long (something the PI failed miserably at). thank you and well done. Now, I know we’ve all blasted parking before but seriously! Especially with the limited below-grade opportunities would it hurt to cut parking requirements in half? Not to mention, there is SO much parking already around the stadiums that is effectively empty without any particular sporting or entertainment event. When I was getting to Amtrak last Thursday morning, I saw several surveyors in safety vests working just outside the entrance to the big parking lot on King St. As I passed by, I overheard one of them say something about ‘all this will be filled up’ as he pointed to the space between himself and the Qwest Stadium. Didn’t have time to stop and do the old man chit chat thing. If we could just get a little more attention on the North Beacon hill.